He went from here less than a year since a stout hearty man but has been sick some time with the dysentery, of which he died. He has relatives here, also his affianced, a bright young girl to whom his death came as a severe blow. At 3:30 in the afternoon of July 27, 1900, the Army transport ship Warren arrived in San Francisco. The Warren brought a variety of soldiers home, and 21 bodies. They included that of James Bowen McCurry of Company E, 32nd Infantry. 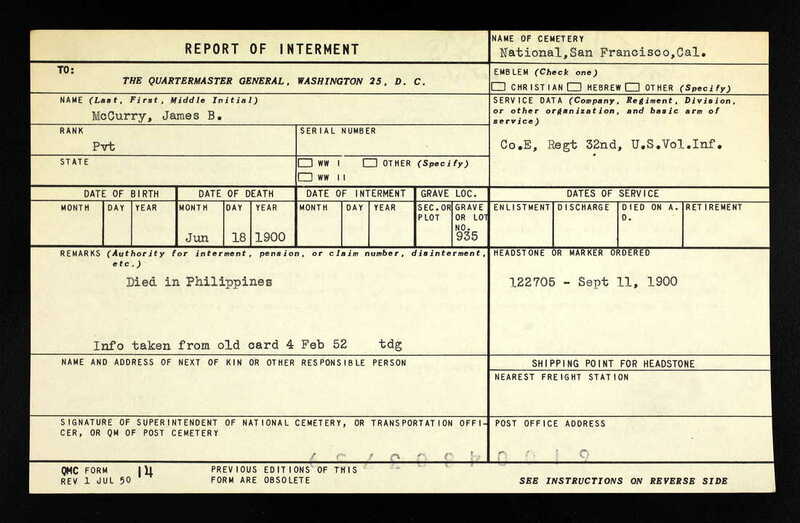 The 32nd Infantry had been fighting in Manila, the Phillipines. The military context is a bit ambiguous. Some have thrown up their hands and called it the Phillipine-American War. It began with the Spanish-American War in 1898, as Cuba and the Phillipines fought for their independence from Spain. In the Phillipines, there was then a continued battle, but this time with the Phillipines fighting for independence from their former American allies. The Americans had taken tover he Phillipines believing that Germany would do so if they didn’t. The subsequent engagements are usually referred to as the Phillipine Insurrection. It went from 1899 to 1902. 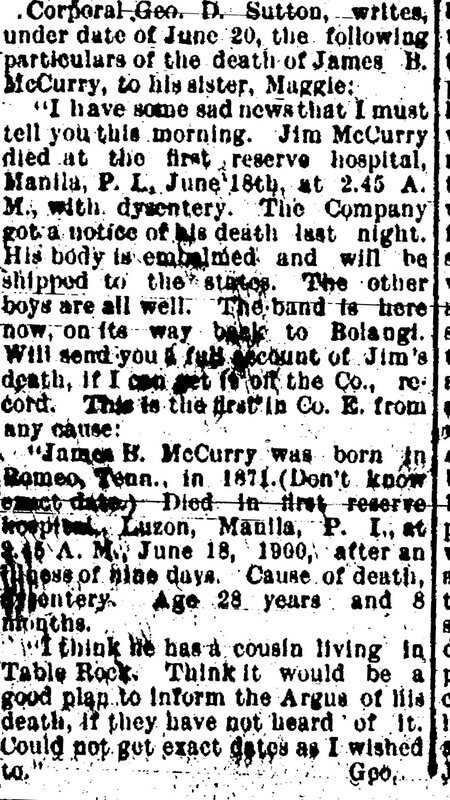 I have some sad news to tell you....Jim McCurry died at the first reserve hospital, Manilla, P. L., June 18th at 2:45 a.m., with dysentery. George Sutton wrote a letter to his sister Maggie and it published in the July 29, 1900 Argus. From this letter we learn that the James B. McCurry whose tombstone sits in San Francisco went by the name of Jim McCurry. From this letter we learn that he was ill for nine days. And that he had at least a cousin in Table Rock. George Sutton, who took the time to gather what details he could about Jim McCurry, is buried in Corpus Christi, Texas. Maggie Sutton, who took her brother's letter to editor Frank Taylor at the Argus, married Dr. Harry Hylton of Table Rock in 1910, and she and Dr. Hylton are buried in the Table Rock Cemetery. ​Probably no one went to San Francisco to stand at his grave. His parents were dead. Whoever his sweetheart was, she almost certainly would not have had the money let alone the savvy for a trip to San Francisco. Perhaps no one has ever visited his grave, or even the graves of his many comrades in arms who lie in that national cemetery. We don’t know whether anyone has visited his grave. We know almost nothing about him, even though he was almost 30 when he died. What little we know is that James was from a large extended family in Greene County, Tennessee. In 1885, a contingent of the McCurry family left Greene County for Nebraska. The obituary of his cousin Nancy McCurry Smith (buried in the Table Rock Cemetery, with her husband John) tells that Nancy and her husband (she was 9 years older than Jim) went with her parents and a number of brothers and sisters to Gage County, Nebraska and the following year to Pawnee County. Nancy was the daughter of Joseph & Priscilla McCurry; Joseph was James’ uncle, a brother of James’ father. Nancy’s brother Henry also lived in Table Rock. Nancy or Henry is the cousin to which the Argus referred. ​In 1896, James’ father died. In 1899, his mother died. They, like many other family members, are buried in the Carter Family Cemetery in Greene County. Jim came to Table Rock after that. Presumably he came to be with the family of his uncle Joe McCurry or even his cousins Henry McCurry or Nancy McCurry Smith. He enlisted after having lived here long enough to find a sweetheart and ask her to marry him. James' cousin Nancy McCurry Smith of Table Rock. She was 9 years older than him. 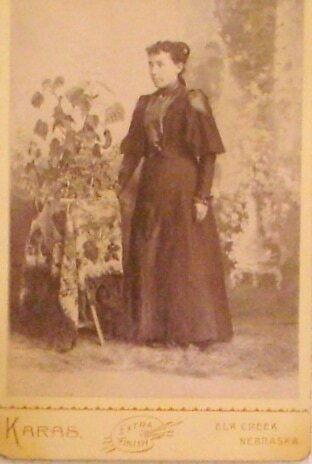 She and her husband John are buried in the Table Rock Cemetery. September 16, 1899 -- The 32nd marches through Leavenworth to the trains. We do not have a picture of Jim McCurry. This is a photograph of what appears to be a soldier off for Manila. It is from the collection of Ines Madden. No name is annotated. There were a number of young men from Table Rock who went to Manila. Whoever this is, let it be a stand in for Jim McCurry. Jim existed, he was a person you could say hello to in Table Rock, a "stout hearty" man with a sweetheart, cousins, and a life before the war.